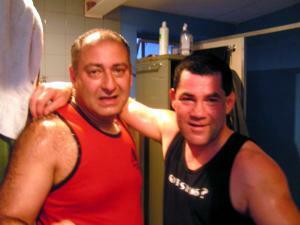 Master Steve Sarkissian and GM Vince Palumbo After the boxing fight in Adalaide, Australia. With the exception of training in Karate for one year at the age of nine, Steve Sarkissian began his training in Martial Arts after he met a fighter who recommended he take martial arts lessons at the International Martial Arts & Boxing Academy in Torrance, California. Steve started training at the IMB Academy in 1991 because he was told that the Instructor there (Sigung Richard Bustillo) was one of the highest and most regarded students under the late great legendary martial artists, Bruce Lee, who had been Steve’s idol when he was a child. Steve Sarkissian trained at the IMB Academy six months a year during his off season from Yosemite National Park until 1996. He later found a place to train on his weekends because of full time employment at Yosemite. He started training at Pacific Martial Arts in Fresno California where he trained under a World Champion Muay Thai Boxer from Thailand “Paul Metayo”, shortly after he started training private lessons with Eskrima Great Grand Master Ramiro Estalilla who was the first and only Filipino Doctorate of Martial Arts and one of the top Eskrima Grand Masters in the world, in 1999 Grand Master Estalilla ranked him as a forth degree Black Belt Bachelor Instructor in Kabaroan Eskrima. 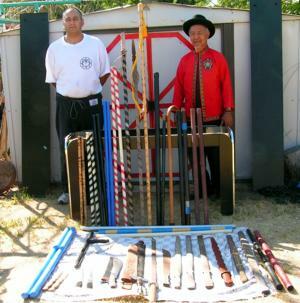 Kabaroan Eskrima utilized big weapons not just small ones like most other eskrima systems. At the beginning of 2001 he started training again at the IMB Academy under Grand Master Richard Bustillo taking his advance classes of Jeet-kune-do which was a blend of Mix Combative Arts including Boxing, Muay Thai, Eskrima, Kali, Gung-fu, and grappling for a period of four years, in the forth year he started training in Brazilian Jiu-jitsu under Fabio Vinelli and assisting the children’s classes and received an Apprentice Instructorship in Jun-Fan Gung-fu (Jeet-kune-do) under Sifu Richard and a level 1 Instructorship in Boxing by the United States Amatuer Boxing Association. At the end of 2005 he went to Cebu, Philippines to train with the greatest Eskrimador that ever lived, Supreme Grand Master Cacoy Canete. He first met Manong Cacoy during one of his seminars in 1994 at the IMB Academy and he had taken other seminars that followed in other years, but now he was able to take private lessons under him for six months. Steve trained at Master Cacoy Canete’s home learning from Canete and his two top Instructors Master Chuck Canete, and Master John Mac. He trained six days a week in Eskrido, Eskrima, Pangamot, Judo at the time he was also taking private lessons in Niten-ishn-ryu and Ishikawa Kenjutsu under Sensei Batayola Isagani, and San Miguel Eskrima under GM Federico Mendoza a lineage from the late GM Mamoy Canete the older brother of GM Cacoy. Making of an Instructional DVD for Cacoy Doce Pares Federation. Torrance CA. Afterwards he went to Chang Mai, Thailand to train with World Muay Thai Champion Kruu Pedro Villalobos at Muay Sangha Academy who taught traditional Muay Thai and ancient Muay Thai known as Muay Baron. The classes there were six hours a day five days a week he stayed and trained there for six months. After Thailand he returned to Cebu to train for another four months at Cacoy Doce Pares Academy where he was given a ranking of second grade Black Belt in Eskrido, Eskrima. 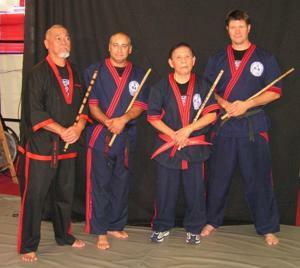 He also received more training in San Miguel Eskrima and Kejutsu, and grappling. My next stop was Rio de Janeiro where he trained Brazilian Jiu-jitsu at the famous Carlson Gracie Jr. dojo under Alan Morias for two months. 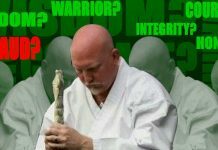 Then he returned to the United States for the IMB Academies Instructors Conference which he have attended once a year and have had the privilege to train under some of the Worlds finest Instructors, Fighters, and lecturers in the Martial Arts. 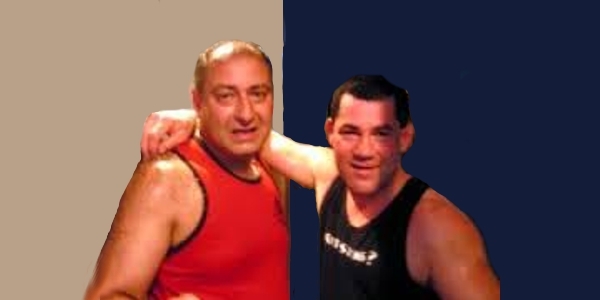 Afterwards he went to train with Grand Master Estalilla at his home for two months training everyday four hours a day privately at his home as he trained me in Sincilia, Bombolia, and Compuesta techniques until he ranked me a six Dan and Master in Kabaroan Eskrima. Creating and instructional video in Fresno,CA. After that he went to train with Grand Master Vince Palumbo for four months and lived in his gym in Adelaide Australia. 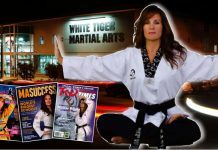 Sensei Vince was a World Champion Fighter on many levels of martial arts and boxing. All this training with Sensei Vince and from everyone at the ICMA Academy got him in shape with training in Boxing, Stickfighting, Eskrima, Grappling, Karate, and Kickboxing. Grand Master Vince Certified him as an Instructor in Combative Martial Arts as well as Arjukempo Karate after proving his abilities by actually fighting. Later Steve Sarkissian went back to the Philippines to train for another three months extensively in Eskrido Eskrima and Kenjutsu. He was able to meet up with a Menkyo Kaiden the Head Instructor of Niten-ishn-ryu Kenjutsu (Colin Hyakutake Watkins Sama). Niten was the school of the legendary Samurai Swordsman Miyamoto Musashi and is considered the most respected Kenjutsu school in Japan where they do national demonstrations annually. 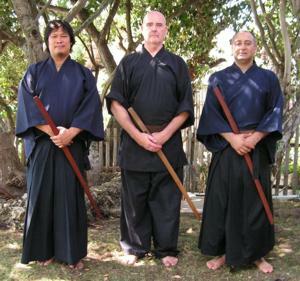 He trained with Sensei Hyakutake on the Island of Bileran near Leyte and through careful evaluation he granted me verbally to teach Niten-ishn-ryu Kenjutsu with a written permission from the Soke and himself to follow. He was also given a certified instructorship by Sensei Batayola Isagani in Ishikawa Kenjutsu. Grand Master Cacoy ranked me third grade Black Belt and a Black Belt in Pangamot the grappling and empty hand version of eskrido, also a verbal agreement to teach San Miguel was given to me by GM Federico Mendoza. and Master Steve Sarkissian in Moal Boal, Cebu, Philippines. Steve Sarkissian returned to USA for another session of the Instructors Conference and another month of training with Grand Master Estalilla as he reviewed and showed him some new techniques to Kabaroan Eskrima, and later returned to the IMB Academy to learn under the eleven time Martial Arts Hall of Fame inductee Grand Master Richard Bustillo and taught and trained for some weeks where Grand Master Bustillo awarded Steve an Associate Instructor in Jun-Fan Gung Fu, Jeet-kune-do. Steve Sarkissian says, “Even though each one of my Instructors had a different method of teaching they have all been wonderful and enlightening”. 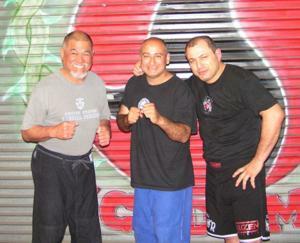 Manong Cacoy, Apo Estalilla, and Sifu Richard have been his mentors for many years. Steve would not have met any of my other great Instructors had it not been for Sifu Richard and my path in life would have been very different. 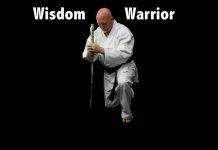 Grand Master Vince and Kruu Pedro have given Steve insight and endurance relating to the fighting aspects of martial arts. All in all Steve realized that he is very fortunate to have had the opportunity in association with such great men. Steve Sarkissian has tried to propagate the martial arts in South America, first in Buenos Aires, Argentina where he was unsuccessful do to poor contacts and in Caracas, Venezuela. His contact in Caracas (Maestro Bruno Cruicchi) pioneered martial arts in Venezuela helped him along with the aid of his family who have helped him every step of the way. Steve Sarkissian had the goal to spread what he learned from his Instructors to South America where there is little or no representation of these Arts and philosophies.